Mexico is in transition towards commercial exploitation of its shale gas, which is being included in two auctions of 24 hydrocarbon blocks, at a time when the country is having difficulty preventing and reducing industrial methane emissions. Since a US Energy Information Administration (EIA) report announced in 2011 that Argentina had some of the world’s biggest shale oil and gas reserves, the dream of prosperity has been on the minds of many people in this South American nation where nearly a third of the population lives in poverty. Earl Hatley, a descendant of the Cherokee/Delaware tribe, has witnessed the consequences of using hydraulic fracturing or “fracking” on his native land to produce shale gas. U.S. activist Vera Scroggins has been sued five times by the oil industry, and since October 2013 she has faced a restraining order banning her from any properties owned or leased by one of the biggest players in Pennsylvania’s natural gas rush, Cabot Oil & Gas Corporation. Unconventional oil and gas reserves in Vaca Muerta in southwest Argentina hold out the promise of energy self-sufficiency and development for the country. But the fracking technique used to extract this treasure from underground rocks could be used at a huge cost. Production here has skyrocketed so fast that for now the installations of the YPF oil company at the Loma Campana deposit in southwest Argentina are a jumble of interconnected shipping containers. 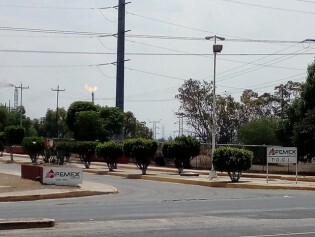 Scientists warn that large-scale fracking for shale gas planned by Mexico’s oil company Pemex will cause a surge in seismic activity in northern Mexico, an area already prone to quakes. Voluntary Fracking Certification Kicks Off in U.S.
A controversial new certification process that could cover a significant portion of the U.S. oil-and-gas “fracking” industry began accepting applications on Tuesday, indicating the formal start of an initiative that has the backing of some key industry players and some environmentalists – but by no means all of either. The Terra 123 oil and gas well in the southeastern Mexican state of Tabasco was in flames since late October, just 1.5 km from a community of 1,500 Oxiacaque indigenous villagers, who were never evacuated. Shale gas extraction is putting some U.S. communities at risk of health issues, new research released here Thursday warns.